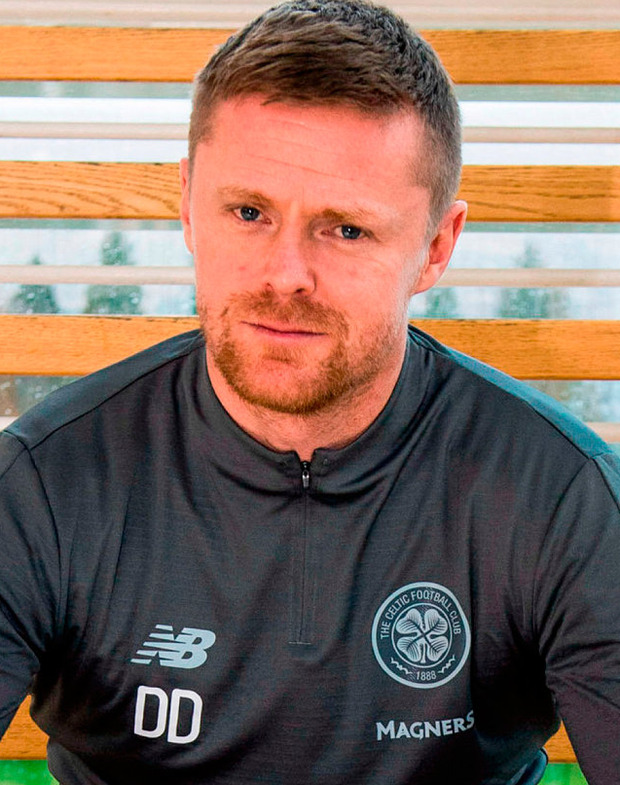 Damien Duff has received a quick promotion to a coaching role with Celtic's first team squad in the reshuffle after the shock departure of Brendan Rodgers to Leicester. Rodgers was announced as Leicester's new boss last night after an agreement was reached to allow him leave the Scottish champions. It has left the Glasgow club reeling as they enter the final stretch of the league season. And they have turned to former boss Neil Lennon as an interim replacement until the end of the season - a stunning turn of events given that he left Hibernian in contentious circumstances earlier this month. The upheaval has also moved Duff up the ladder with his new employers. Rodgers is taking his backroom staff with him to Leicester with assistants Kolo Toure and Chris Davies and head of performance Glen Driscoll also making the move south. Therefore, Lennon will be assisted by Duff and former Celtic defender John Kennedy. Duff officially joined Celtic's underage coaching staff last month after accepting an offer to move his family over from Ireland where he had been working with Shamrock Rovers as their U-15 boss. He did previously spend some time on first team manager Stephen Bradley's staff before concentrating on working with the youngsters. The Dubliner's new brief was as reserve team coach working alongside Tommy McIntyre. He said that the opportunity to take on a role with a club he had admired from afar was the only thing that could have tempted him away from Ireland. However, he will now take on a much more prominent role than was initially anticipated as Lennon looks to steer the club towards another title. They are eight points clear of second-placed Rangers with 11 games remaining.